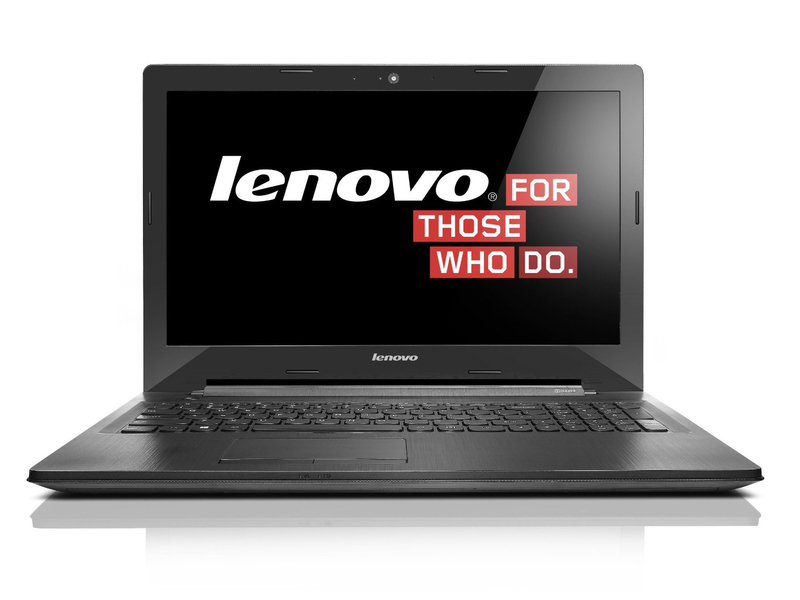 Lenovo has countless laptop models from the most various price and configuration categories within its G50 product line. We previously tested two members of the range in the forms of the IdeaPad G50-70 (Core i5-4200U, Radeon R5 M230) and IdeaPad G50-45 (AMD A6-6310, Radeon R4 (Beema)). Now we have our hands on the lowest priced model of the series dubbed G50-30. Lenovo does not even use the label "IdeaPad" for this incarnation. Does Lenovo have a decent low-budget laptop in its lineup with the G50-30? 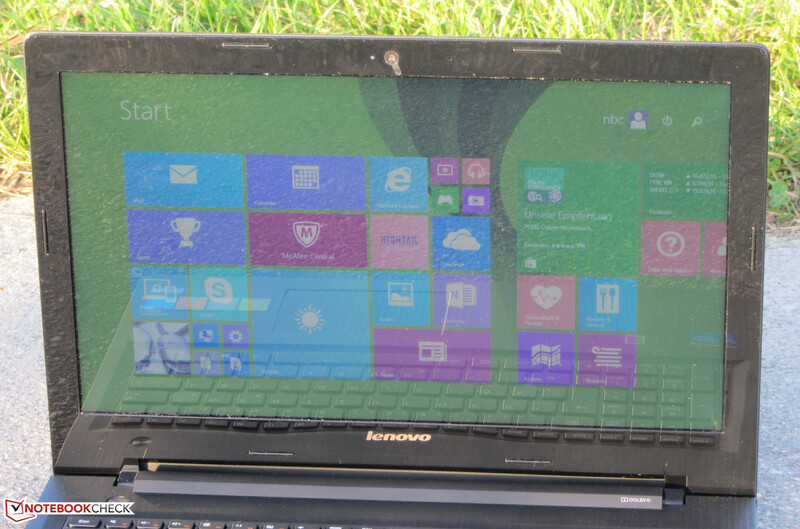 All low-budget laptops are rivals, in particular models that feature the Windows 8.1 with Bing operating system. We have encountered many of the kind recently, among others, Asus' X551MAV-SX391B, Packard Bell's EasyNote TF71BM-C8R1, and HP's 250 G3. Since the G50-30 is identical to the G50 models we tested, we will not go in-depth about casing, connectivity, input devices or speakers. The corresponding information can be found in the reviews of the IdeaPad G50-45 and IdeaPad G50-70. Like in both previously reviewed G50 models, the G50-30 is equipped with a 15.6-inch, glare-type screen. It has a native resolution of 1366x768 pixels, and the brightness of 216.1 cd/m² corresponds to the laptop's price level. The screens in HP's 250 G3 (206.4 cd/m²) and Asus' X551MAV (203.3 cd/m²) are on par. While the screen's brightness is still acceptable in view of the price, the contrast of 161:1 and black level of 1.4 cd/m² are abysmal. Such rates are not acceptable even in the low-budget sector. Packard Bell's EasyNote TF71BN-C8R1 (532:1; 0.37 cd/m²), for example, proves that better is possible. The screen's average DeltaE 2000 shift in state of delivery is 14.49. That is worse than the majority of screens that we have tested (DeltaE from 10 to 12). A rate less than 3 would be desirable. The screen also exhibits an intense bluish cast. The screen in the G50-30 only offers limited viewing angles. That was expected and is normal in the price range of Lenovo's laptop. It will only be possible to use the laptop in the shade outdoors. The combination of a reflective surface and low contrast thwart anything else. Lenovo offers a basic office laptop for a low price with its G50-30. The laptop's power will not really be enough for applications that go beyond office and Internet. Our review sample is sold for approximately 270 Euros (~$337), but Lenovo has countless other configurations within the G50 line, with both Intel and AMD innards. 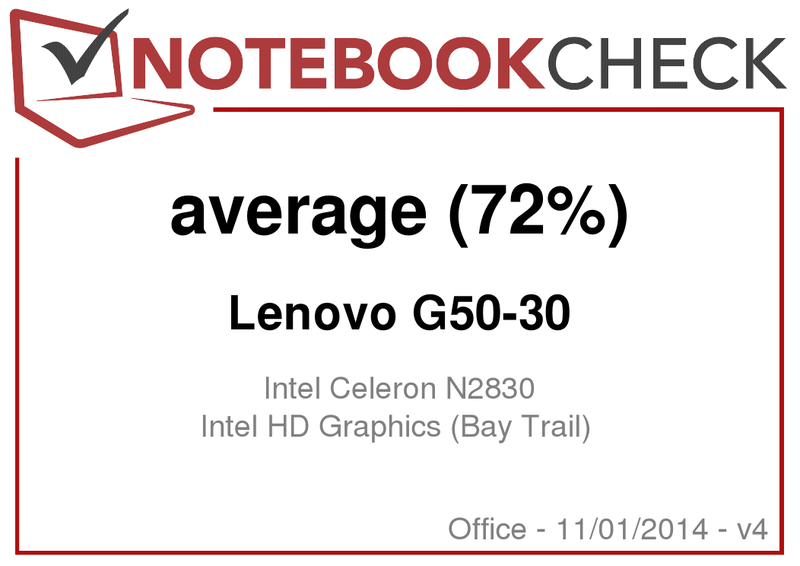 Like in most below-300 Euro (~$374) laptops that we have recently tested, Lenovo's G50-30 is powered by an Intel Celeron N2830 dual-core processor (Bay Trail). It clocks with a base speed of 2.16 GHz, which can be increased to 2.416 GHz via Turbo. The CPU performed the tests of the Cinebench benchmarks with its full speed (2.416 GHz). The processor operated with its base clock of 2.16 GHz in battery mode. The G50-30 runs smoothly. The low operating speed of 2 GB is first really noticed when multiple windows are open. The PCMark benchmark scores are at the lower end of the performance scale. That is not surprising and corresponds to the capacities of the installed processor. A hard drive from Western Digital is installed. It has a capacity of 320 GB and spins with 5400 revolutions per minute. The drive's transfer rates are slightly disappointing. HD Tune recorded an average transfer rate of 73.1 MB/s. Modern hard drives should achieve rates from 80 to 90 MB/s. However, the drive's relatively low access time is pleasing. Intel's weakest GPU is responsible for video output. The HD Graphics core supports DirectX 11 and clocks with speeds of up to 750 MHz. The chip cannot compete with the stronger AMD counterparts, such as the Radeon R3 (Mullins/Beema) and Radeon R4 (Beema). The G50-30 is not meant for playing up-to-date 3D games. Smooth frame rates are only possible with a handful of games - and then only in a low resolution and low quality settings. This looks different with games from the Windows Store. Most titles should be playable. The G50-30 is fan-less. Consequently, only the hard drive's base noise and access noises are heard from the laptop. The graphics core always performed the stress test (Prime95 and Furmark run for at least one hour) with 720 MHz. The processor started the stress test with 2.416 GHz but throttled to 2.166 GHz after a while in AC mode. 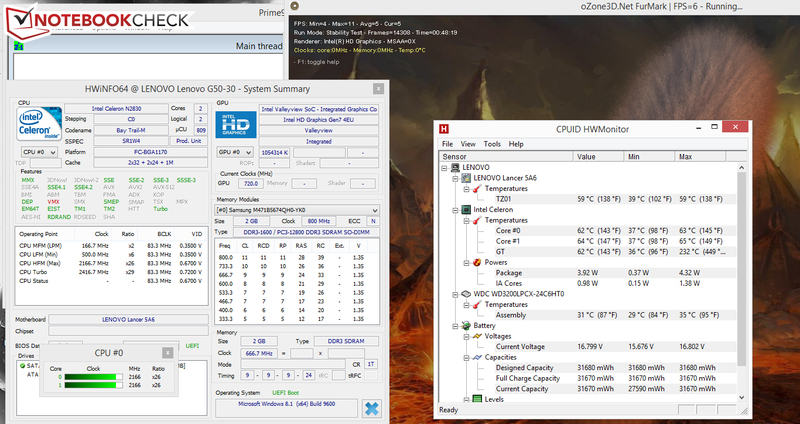 The CPU operated with 2.166 GHz from the outset in battery mode. The casing did not heat up excessively despite the fan-less design. 40 °C was only surpassed on two measuring points in the stress test. The virtually identically equipped Asus X551MAV-SX391B and Packard Bell's EasyNote TF71BM-C8R1 stay cooler during full load because they both have a fan. Intel's Bay Trail processors are overall quite energy efficient and thus correspondingly configured laptops are fairly economic in total. The G50-30's power requirement climbed to 14 watts in the stress test, which is on par with comparable laptops like Asus' X551MAV-SX391B or Packard Bell's EasyNote TF71BM-C8R1. Websites are opened automatically every 40 seconds using the energy-saving profile and a screen brightness of approximately 150 cd/m² in the practical Wi-Fi test. The G50-30 achieved a runtime of 5:11 h here, which is a good rate. Packard Bell's EasyNote TF71BM-C8R1 (7:09 h) also from the low-budget sector lasts considerably longer. We have now encountered the hardware platform used in the G50-30 in multiple laptops. Like identically configured contenders, such as Asus' X551MAV-SX391B and Packard Bell's EasyNote TF71BM-C8R1, the G50-30 is also apt for basic tasks like browsing, Skype or watching videos. The laptop only needs little power and operates quietly. Users who replace the installed hard drive with a solid state drive will have a silent laptop. That would not be a problem owing to the maintenance cover. The biggest shortcoming of Lenovo's laptop is its screen: It only has a very low contrast and displays a major color shift. The one-year warranty also has to be reproached. Acer includes a two-year warranty on its Packard Bell EasyNote TF71BM-C8R1. In contrast to the G50-30, Packard Bell's EasyNote TF71BM-C8R1 also offers a matte screen and a considerably better battery life. The laptop is silent apart from the hard drive's noise. A brighter, higher-contrast screen with a matte surface. While other manufacturers include a two-year warranty even in the low-budget sector, Lenovo only grants twelve months. Lenovo IdeaPad G50-45, HP 250 G3, Acer Extensa 2509-C052, Packard Bell EasyNote TF71BM-C8R1, Asus X551MAV-SX391B.